I live in Port Melbourne. The North-South streets all end at the Bay. 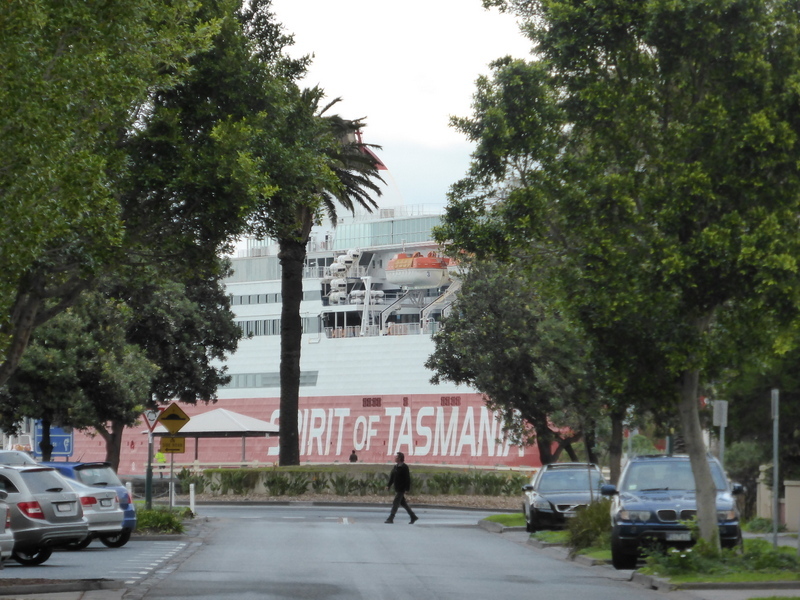 Here the red and white Spirit of Tasmania ferry arrives at dawn, and spends the day at Station Pier loading and unloading passengers and huge trucks. At 7.30 pm it slips down the channel in Port Phillip Bay for the return overnight voyage to Devonport in Tasmania. In summer, towering white cruise ships dock on the other side of the pier, the passengers temporarily filling the 109 tram into Melbourne. Sometimes, while waiting for coaches, they spill out over the bike path with their rolly suitcases. Meanwhile life goes on at the cafes, the Bay Street shops and Lagoon Park where dogs can run off-lead. Such a familiar experience to me!